Compact unit includes 3-1/2 gallon tank, only 10-1/2" high. Automatic submersible pump with mid-level activating switch and 8' power cord. 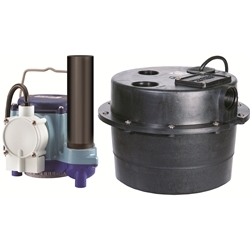 Call us for specific replacement pump. Basin is IAPMO approved.